In addition to discussing how these leaders operate at their highest level while caring for themselves and others in their personal and professional lives, they’ll also address a range of current workplace issues including the #MeToo movement. Women, still today, are far less represented in top jobs. While women make up nearly half the labor force, only 5.2% of S&P 500 Companies have a woman CEO. Only 11 percent of the top earners are women. Women hold just 21 percent of board seats and fill 26.5 percent of first/mid-level management roles according to Catalyst. “We have a lot of work to do,” says Good. 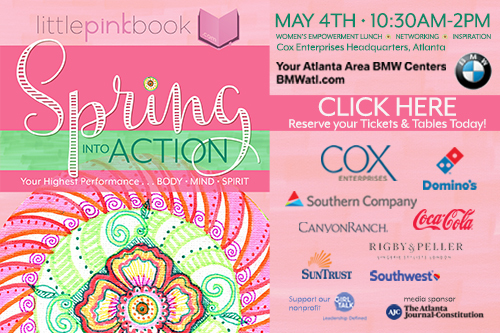 The signature event on May 4th from 10:30am-2pm will feature an elegant lunch experience and the opportunity to network with some of America’s top business leaders at the beautiful Cox Enterprises Headquarters. Prior to lunch and the panel discussion, guests will network in the PINK Bazaar beginning at 10:30am. Attendees will have the opportunity to build life-changing professional relationships as they sample and shop with vendors who cater to working women. Over the last 13 years, PINK networking has resulted in multi-million-dollar deals and the establishment of a foundation for high-profile business relationships. This year’s event will also support Girl Talk, a nonprofit assisting girls in developing confidence and leadership skills. Over the years, PINK has raised more than $100,000 for nonprofits which support women and girls. 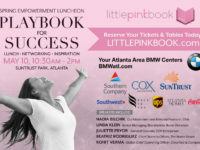 Little PINK Book is an events and digital platform for ambitious career women which hosts Spring and Fall empowerment events.